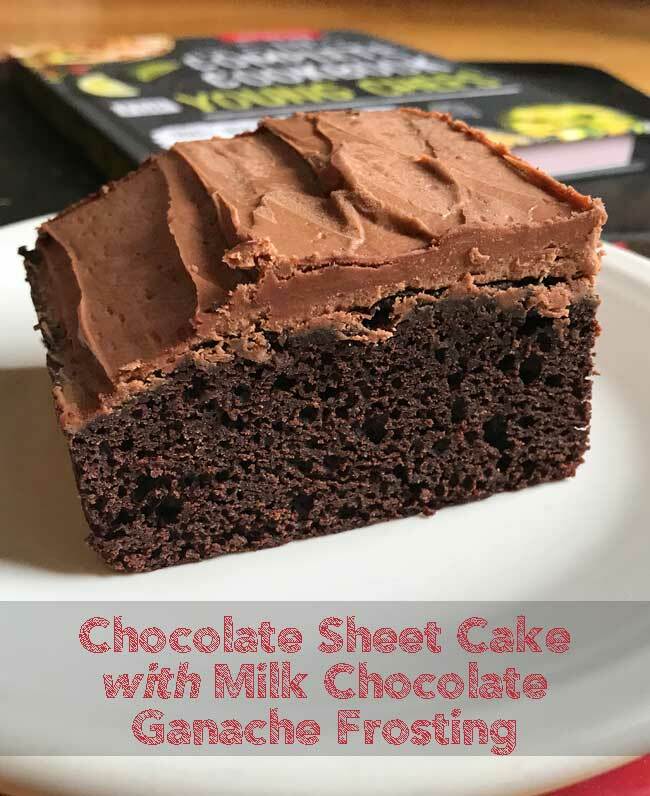 This fantastic chocolate sheet cake is from The Complete Cookbook for Young Chefs, 100+ Recipes That You’ll Love to Cook And Eat, a new book from America’s Test Kitchen. But before I say more about the cake, I’m happy to share the news that America’s Test Kitchen has launched a new media brand called www.ATKkids.com. 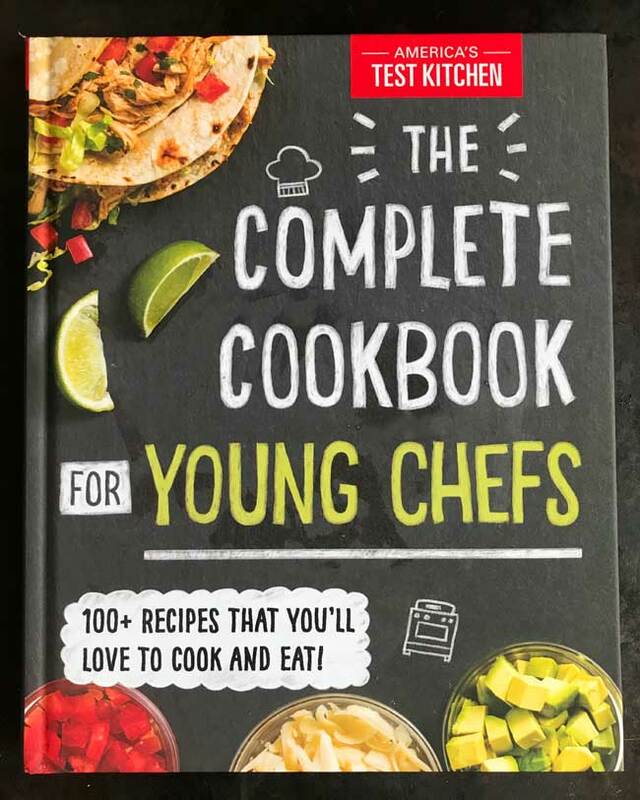 ATKkids is designed for cooks ages 8 through 13, and while I’m a wee bit older than the target market, I perused the new site and immediately found 3 recipes I want to make for the family — Avocado Crema, DIY Hot Cocoa Mix and Sweet and Tangy Glazed Salmon. So many of the recipes sound awesome, but I need to tell you this cake. It’s a rich chocolate cake that along with Dutch process cocoa, calls for 8 oz of melted chocolate chips. As you can imagine, this is not a light and fluffy cake but rather a deep, dark cake. And then there’s the method used to make the cake. The batter is stirred together by hand in a large saucepan. While you will need an extra bowl for mixing the dry ingredients, the process of just stirring everything in the saucepan is pretty relaxing and the recipe has a great flow to it (which is probably why I’ve made it twice now). The milk chocolate frosting is also special because it’s made with just three ingredients — milk chocolate chips, heavy cream and softened butter. I had fun watching the melted chocolate, cream and butter mixture transform from ganache to a fluffy batch of frosting and experimenting with different types of chocolate. The frosting in the first photo is made with melted milk chocolate chips (as per the book) and the lighter colored frosting in the second photo is made with Lindt milk chocolate. The chocolate chip version was actually a little better in my opinion, proving once again that ATK always has a a reason for what ingredients they use. Still, it was fun to experiment. 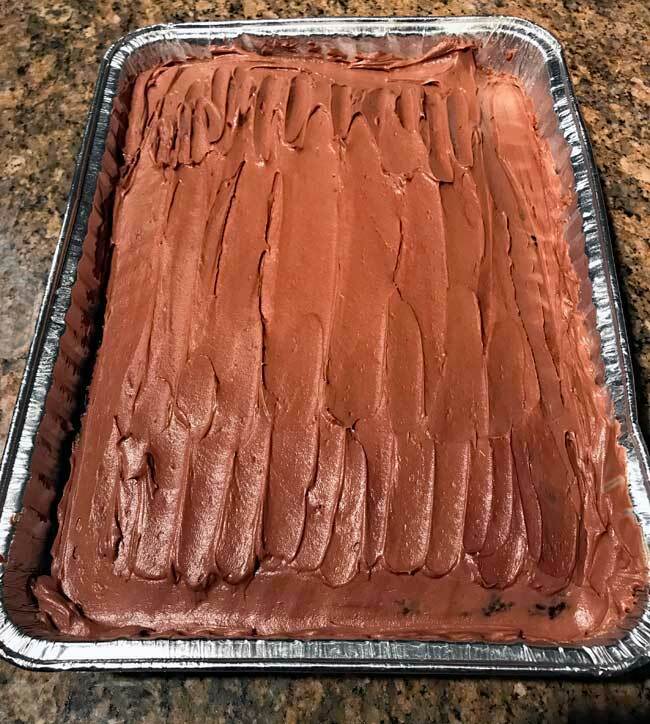 Milk Chocolate Frosted Sheet Cake Makes about 16 servings From “Complete Cookbook for Young Chefs” by America’s Test Kitchen. To make cake: Adjust oven rack to middle position and heat oven to 325 degrees. Spray a 13-by-9-inch metal baking pan with vegetable oil spray. In medium bowl, whisk together sugar, flour, baking soda and salt. In large saucepan, combine chocolate chips, milk and cocoa. Place saucepan over low heat and cook, whisking often, until chocolate chips are melted and mixture is smooth, about 5 minutes. Remove saucepan from heat and let mixture cool slightly, about 5 minutes. Add oil, eggs and vanilla to saucepan with chocolate mixture and whisk until smooth, about 30 seconds. Add flour mixture and whisk until smooth, making sure to scrape corners of saucepan. Use rubber spatula to scrape batter into greased baking pan and smooth top. Place baking pan in oven. Bake until toothpick inserted in center comes out with few crumbs attached, 30 to 35 minutes. Remove baking pan from oven and place on cooling rack. Allow cake to cool completely in pan, about 2 hours. 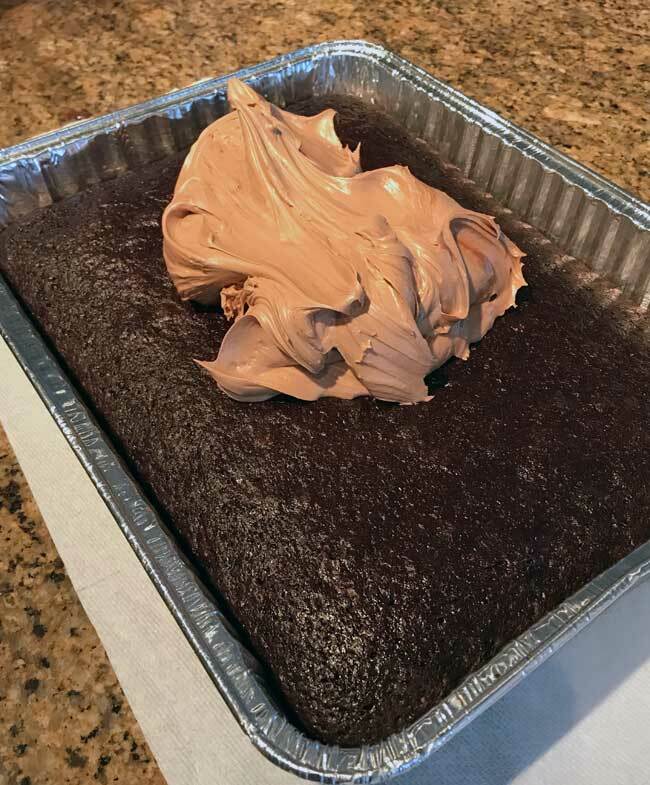 To make frosting: In a large microwave-safe bowl (I used a Pampered Chef batter bowl for this), combine chocolate and cream. Heat in microwave at 50 percent power for 1 minute. Take out and stir with rubber spatula. Heat in microwave at 50 percent power until melted, 1 to 2 minutes. Remove bowl from microwave. Add softened butter to chocolate mixture and use whisk to stir and break up large butter pieces. Let sit until butter is fully melted, about 5 minutes. Whisk until completely smooth. Refrigerate frosting until cooled and thickened, about 1 hour. Use electric mixer to beat frosting on medium-high speed until frosting is light and fluffy, 30 seconds. Use icing spatula to spread frosting evenly over cooled cake. Cut cake into pieces and serve. Recipe adapted from America’s Test Kitchen, the home of Cook’s Illustrated and Cook’s Country magazines, is also a cookbook publisher, a TV show, an online cooking school and a subscription website. Visit www.americastestkitchen.com. And what’s inside is even better. America’s Test Kitchen put together a nice collection of simple recipes kids like eating and would probably love to learn to make on their own without adult supervision. Examples include Hummus, Guacamole, Avocado Toast, Quinoa with Herbs, Quick Tomato Salsa, Beef and Bean Chili, Turkey Burgers, Panini — you get the gist of it. The recipes are for the basics and laid out in a very inviting manner with all kinds of tips and hints like why you should put baking soda in chili, how to freeze your waffles, how to make hot chocolate in balls instead of packets, the perfect vegetable peeler and my favorite tip/recipe of all how to make an amazing milk chocolate frosting with just three ingredients. The book sounds great as does the website. I will check both out. This cake sounds like a great recipe and one we would enjoy!